Cognizant Technology Solutions Corporation (NASDAQ: CTSH), a leading provider of information technology, consulting, and business process outsourcing services, today announced its first quarter 2012 financial results. - Quarterly revenue rose to $1.71 billion, up 24.8% from the year-ago quarter and 2.9% sequentially. - Quarterly diluted EPS on a GAAP basis was $0.79, compared to $0.67 in the year-ago quarter. - Quarterly diluted EPS on a non-GAAP basis, which excludes stock-based compensation expense, was $0.86, compared to $0.71 in the year-ago quarter. - GAAP and non-GAAP diluted EPS includes the impact of $0.02 in net non-operating foreign currency exchange losses. - Net headcount addition for the quarter was approximately 2,800. Revenue for the first quarter of 2012 rose to $1.71 billion, up 24.8% from $1.37 billion in the first quarter of 2011. GAAP net income was $243.7 million, or $0.79 per diluted share, compared to $208.3 million, or $0.67 per diluted share, in the first quarter of 2011. Diluted earnings per share on a non-GAAP basis was $0.86. GAAP operating margin for the quarter was 18.6%. Excluding stock-based compensation expense of $31.4 million, non-GAAP operating margin was 20.4%, slightly higher than the Company’s targeted 19-20% range. Reconciliations of non-GAAP financial measures to GAAP operating results and diluted EPS are included at the end of this release. - Second quarter 2012 revenue anticipated to be at least $1.79 billion. - Second quarter 2012 diluted EPS expected to be $0.80 on a GAAP basis and $0.87 on a non-GAAP basis, which excludes estimated stock-based compensation expense. - Fiscal 2012 revenue expected to be at least $7.34 billion, up at least 20% compared to 2011. - Fiscal 2012 diluted EPS expected to be at least $3.36 on a GAAP basis, and $3.62 on a non-GAAP basis, which excludes estimated stock-based compensation expense. - EPS guidance excludes any future non-operating foreign currency exchange gain or loss. “Similar to last year, we slightly exceeded our target operating margin during the first quarter—which positions us well to absorb our annual salary increases which will impact us during the second quarter, while maintaining operating margins within our target range for the year,” said Karen McLoughlin, Chief Financial Officer. “In addition, we repurchased $43 million of shares under our share repurchase program during the quarter and expanded the program to $1 billion, reflecting confidence in our growth opportunities, our commitment to drive shareholder value, and our ability to generate strong cash flows." Today, the Company announced that its Board of Directors has authorized the expansion of its existing share repurchase program by $400 million, bringing the total authorization under the current repurchase program to $1 billion. To date, $423 million of shares have been repurchased under this program. In addition, Cognizant's Board has extended the expiration date for the repurchase program to December 31, 2013. Repurchases under the program may be made in the open market or through privately negotiated transactions in accordance with applicable federal securities laws, including Rule 10b-18. The timing of repurchases and the exact number of shares of common stock to be purchased will be determined by the Company's management, in its discretion, and will depend upon market conditions and other factors. The repurchases will be funded using the Company's cash on hand and cash generated from operations. The program may be extended, suspended or discontinued at any time. 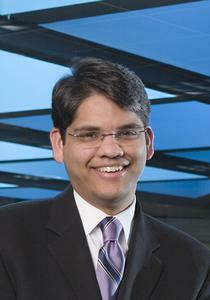 Cognizant will host a conference call May 7, 2012 at 8:00 a.m. (Eastern) to discuss the Company’s first quarter 2012 results. To listen to the conference call, please dial (800) 374-0467 (domestic) and (706) 679-3288 (international) and provide the following conference ID number: 70589605. For those who cannot access the live broadcast, a replay will be available by dialing (855) 859-2056 for domestic callers or (404) 537-3406 for international callers and entering 70589605 from a half hour after the end of the call until 11:59 p.m. (Eastern) on Monday, May 21, 2012. The replay will also be available at Cognizant’s website www.cognizant.com for 60 days following the call. To supplement the consolidated financial statements presented in accordance with GAAP, this press release includes the following measures defined by the Securities and Exchange Commission as non-GAAP financial measures: non-GAAP operating margin and non-GAAP diluted earnings per share. These non-GAAP measures are not based on any comprehensive set of accounting rules or principles and should not be considered a substitute for, or superior to, financial measures calculated in accordance with GAAP, and may be different from non-GAAP measures used by other companies. In addition, these non-GAAP measures, the financial statements prepared in accordance with GAAP and reconciliations of Cognizant’s GAAP financial statements to such non-GAAP measures should be carefully evaluated. We seek to manage the company to a targeted operating margin, excluding stock-based compensation costs, of 19% to 20% of revenues. Accordingly, we believe that non-GAAP operating margin and non-GAAP diluted earnings per share, excluding stock-based compensation costs, are meaningful measures for investors to evaluate our financial performance. For our internal management reporting and budgeting purposes, we use financial statements that do not include stock-based compensation expense for financial and operational decision making, to evaluate period-to-period comparisons and for making comparisons of our operating results to those of our competitors. Moreover, because of varying available valuation methodologies permitted under U.S. GAAP and the variety of award types that companies can use, we believe that providing non-GAAP financial measures that exclude stock-based compensation expense allows investors to make additional comparisons between our operating results to those of other companies. Accordingly, we believe that the presentation of non-GAAP operating margin and non-GAAP diluted earnings per share, when read in conjunction with our reported GAAP results, can provide useful supplemental information to our management and investors regarding financial and business trends relating to our financial condition and results of operations. A limitation of using non-GAAP operating margin and non-GAAP diluted earnings per share versus operating margin and diluted earnings per share calculated in accordance with GAAP is that non-GAAP operating margin and non-GAAP diluted earnings per share exclude costs, namely stock-based compensation, that are recurring. Stock-based compensation will continue to be for the foreseeable future a significant recurring expense in our business. In addition, other companies may calculate non-GAAP financial measures differently than us, thereby limiting the usefulness of these non-GAAP financial measures as a comparative tool. We compensate for this limitation by providing specific information regarding the GAAP amounts excluded from non-GAAP operating margin and non-GAAP diluted earnings per share and evaluating such non-GAAP financial measures with financial measures calculated in accordance with GAAP. Cognizant (NASDAQ: CTSH) is a leading provider of information technology, consulting, and business process outsourcing services, dedicated to helping the world's leading companies build stronger businesses. Headquartered in Teaneck, New Jersey (U.S.), Cognizant combines a passion for client satisfaction, technology innovation, deep industry and business process expertise, and a global, collaborative workforce that embodies the future of work. With over 50 delivery centers worldwide and approximately 140,500 employees as of March 31, 2012, Cognizant is a member of the NASDAQ-100, the S&P 500, the Forbes Global 2000, and the Fortune 500 and is ranked among the top performing and fastest growing companies in the world. 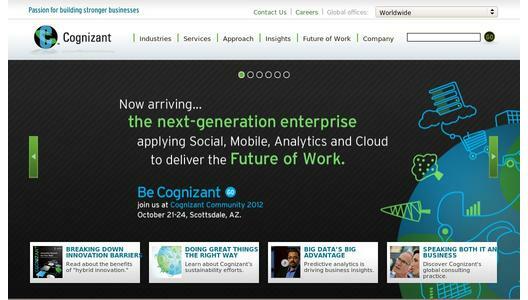 Visit us online at www.cognizant.com or follow us on Twitter: Cognizant.